There have always been wrecks. That’s why we have lights. There have been a series of ships run aground on Sand Island. Survivors all say the same thing - that they saw the lights for Duluth Harbor and steered for them, only to realize too late they were terribly off course, usually just before the ship hits the rocks. It’s costing small fortunes and many sailors now don’t want to go out. The rumors that there are wreckers — but who benefits if they are? Or, is it some kind of haunting?. This adventure for the fun vs. Ghosts game clocks in at 11 pages, 1 page front cover, 1 page editorial, 1 page SRD, leaving us with 8 pages of content. The pages are laid out for digest-size (6’’ by 9’’/A5), which means you can fit up to 4 of them on a given sheet of paper if you’re conserving ink. Now, first things first: The adventure takes place around mysterious circumstances in the Apostle Islands National Lakeshore – my US-readers will probably be aware of this beautiful area at Lake Superior, but for an ole’ German like yours truly, checking them out via google etc. was rather inspiring and really made me wish I could visit them. This also grounds the module in a believable sense of reality. In my review of the rules-book, I mentioned that the engine can be easily used to run games for both adults and kids. Well, this module retains this aspect. As a whole, I consider this to be a child-friendly module. As an aside: If I had the option, I’d probably run this on site! Running this around the campfire while staying on the islands would add another, special touch to the proceedings. Now, I strongly suggest reading the module in its entirety – this is not necessarily a go-play module and its brevity may warrant further research if employed at the table rather than while on a trip, but that as an aside. All righty, only Ghostmasters around? The residents of Duluth are worried. In the few weeks, a couple of boats have stranded on Sand Island, ostensibly following lights. While none of the big lakers have stranded so far, it is only a matter of time. The module does provide some guidance regarding the general area and also points towards further articles on the net for research, should additional details be required. Since the area is known for being rather touristy, it should be no problem to get the PCs involved. The night the PCs arrive on location, the Benjamin Lark runs ashore on the east side of Sand Island – working with Coast Guard and/or rangers (who include a fair share of “believers” in vs. Ghost’s world), the PCs get a chance to interview the captain, who speaks of malfunctioning navigational instruments and lighthouse-like light – which seasoned ghosthunters may tie to Ghost orbs – but much larger! The Benjamin Lark could have almost hit the Sevona – a wreck popular with wreck divers. Cool: The pdf does note that investigation may actually take the form of real life online research – the Sevona is a real wreck! 7 men died in the wreckage of this ancient ship, with two bodies found on the beach. Talking to rangers and collating further information from previous incidents will help: The PCs may even question the grandson of a survivor from the Sevnoa’s wreck. Mysteriously, the lighthouse sports no malfunction – though diligent research will unearth that a cottage of Camp Estella has been built from a part of the Sevona and is currently undergoing repair. Which also would be the poodle’s core: The damage to the cottage has disturbed the rest of the per se noble D.S. MacDonald, captain of the Sevona – and when visibility is poor, he haunts the shores. Ghosthunters can find him in the fog – and he thinks he is warning the ships away from the shoal that wrecked his ship. A benevolent, if misguided division IV ghost, he does have stats for combat, if desired, but he may similarly just be convinced that he isn’t helping, allowing for a happy ending for the module and the option to solve it sans violence. Destroying the whole cottage may be another way to stop the haunting, but ultimately how the finale pans out s left up to the discretion of the GM. Editing and formatting are very good, I didn’t notice any serious glitches. Layout adheres to the colorful, nice 1-column full-color standard of vs. Ghosts and the pdf doesn’t sport bookmarks. At the brief length, that’s okay and only represents a minor comfort-detriment. The hyperlinks to real world homepages help enhance the illusion of plausibility, as does the stock photography used as artwork. The pdf has no maps, but neither system, not set-up require them and the real-world backdrop means that there’s plenty of cartography to go around. 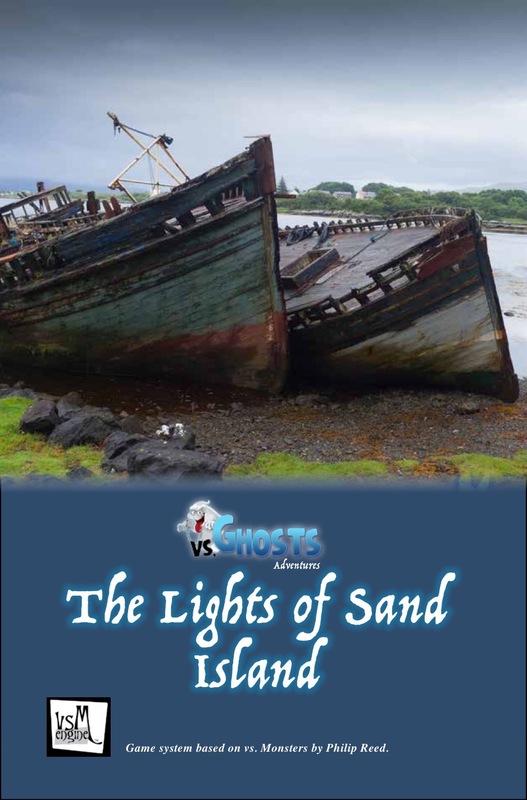 Jennifer R. Povey’s module is what I’d call a “Feel-good ghost story” – it lacks any malevolence, is a bit educational and provides a simple, brief mystery to unearth for the players. It doesn’t reinvent the wheel, but it doesn’t have to. As per the writing of this review, this module is ridiculously cheap and for its very fair price-point, it is a truly entertaining little set-up. This is not a module that will challenge seasoned investigators, but as a sidetrek or, as a first investigation for kids, it makes for a great offering that may actually expand the player’s horizon. Kids in particular will enjoy the module – for this audience, I’d rate this 5 stars. Adults may be less impressed by the simplicity of the proceedings and plot; such audiences should probably deduct a star. My official verdict will reflect the use for kids and thus, the 5-star rating.